No doubt the competition is fierce, but this could be the dumbest thing ever written by a Murdoch employee on climate change. Heaven knows the competition is stiff: every day throws up extraordinary claims by any number of columnists in the Murdoch media. But we think we have found what could be the dumbest thing ever written by a Murdoch employee on climate change. The basis for Devine’s article was that the recent heatwave – which the Bureau of Meteorology describes as record breaking, and included a record 46.9°C high for Penrith in Sydney’s west – was just another hot summer. Proof? Why, in 1837, Sydney had recorded temperatures of 54°C, Devine claimed. Now, how to explain this. As most 6-year-olds might understand, when you take a temperature reading, you do it in the shade, not in the sun. Australia’s BoM makes the same point, noting that it monitors temperatures in a louvre box known as the “Stevenson” screen. Just as an experiment, the air temperature where I am writing this article is 28°C. So I took the thermometer out to the sun. Even with the clouds, it rose to 36°C. When the clouds parted, it quickly jumped to more than 50°C before I brought it back inside. So yes, the thermometer may have been showing 56°C in the sun in Sydney on that day in 1832 and maybe a million times since in thousands of different places. One of Devine’s own readers claimed it was 68°C on the court at the Australian Open this year. Perhaps it was. But that’s in the sun. It wasn’t Melbourne’s official temperature that day. It’s why on hot days you can fry an egg on a road or a car bonnet exposed to the sun. Try doing it inside on the dining table; it may not work so well. And that’s probably why newspaper offices have a roof. Chances are that if you leave a journalist out in the sun too long, they might end up writing silly things about climate change. (PS. We wonder if the quote from the Sydney Gazette is truly accurate. Celsius was only widely used in Australia from the 1970s with the introduction of metrication. Indeed, it turns out Devine can’t even cut and paste properly. Rather than “working bullocks dropped dead”, there was just one. A BoM spokesman told RenewEconomy that official record began in Australian in 1910, but even the papers of the day in the 1800s warned about reported temperature observations, noting they could not be verified and often thermometers were left hanging in the sun or on a verandah. Even the official records from earlier years have strange reading with a difference of considerable degrees in the same area on the same day. Rainfall is also of some question because it became obvious that the readings were not taken Saturday afternoon Sunday morning and Evening but early Saturday then Monday morning. A copy and paste from the Year Book Australia. Automatic reading have prevented this kind of problem. As to the poor journalist no doubt her article would be taken as great reading by people with little idea about the actual early records. One of the previous stations was open on one side with the obvious problem of sun intrusion making a mess of the readings. We get the same sort of attitudes from politicians the first time it’s really cold in Canberra. It’s incredibly irresponsible because so many people read it and allow it to inform their opinion. Imagine if we treated medical science like vaccines and antibiotics this way? Have you not being taking notice of the lunatic populists on left and right, they do want us to start treating medical science that way too. We live in horrifying times. Indeed, the deputy PM has form in this area. Fortunately The Australian is a paid website and thus I don’t get to read what the moronic Miranda Devine writes. The ignorant writing for the ignorant. Perhaps the temperature reached 54 degrees Fahrenheit. Once again Ms Devine demonstrates the axiom that sound facts should never get in the way of a good prejudice. If you feel like reading more dumb comments check out the comments in relation to the article. Astounding the complete lack of basic scientific understanding and critical thinking. Any article about Devine that fails to refer to her as ‘legacy kid, Miranda Devine’ is failing in its simple duty. Two, it is important to remind everyone that Miranda’s entire career is based on who here dad was, he was also a reactionary relic of another time poisoning his present with his out-dated bigoted awful views. This is important because when she attacks people on welfare or minimum wage or any of the other disadvantaged groups she loves to attack.it is good to remind her that she is just ‘confused why everyone else can’t pull themselves up by their daddy’s bootstraps like she did’. It is definitely an entry but Miranda Devine really should be handicapped as she consistently writes dumb drivel, perhaps a book should be established with the appropriate handicaps. Perhaps you should start a web rating site where journalists can be rated. There is a problem who is going to rate them? If any person can rate the outcome will be the most popular will get a good rating. Perhaps rate it against knowledge now who is going to do that? The above will rate as -10 . I found the Gazette article on Trove. It’s an Agricultural Report for the Illawarra. Speaking about Saturday the 18th of February, 1832, it indeed says the day was “insufferably warm”, and “the thermometer at one o’clock pm, in the sun, was as high as 130 degrees”. And it was just one “working bullock” that died – the other fell down, but was nursed back to health. magnificent! can you take a screen shot and send through? I followed a few links to get to the original source in the Book of Dates. https://archive.org/details/australiandicti00heatgoog page 118. The image is a screen shot from a digital scan of the Book so it is not so sharp. 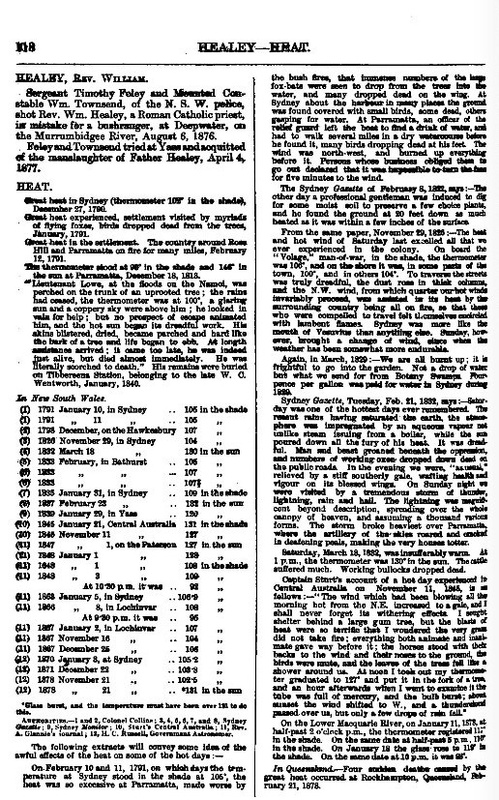 However, the 18th March 1932 list text entry can be clearly seen as 130 Degrees F in the sun in the middle of the second column. I also note that Miranda’s quote is lifted from a similar opinion by her printed in The Daily Telegraph back in 16 January 2013. Looks like she will roll out the story during any record breaking heatwave. In searching for the original source I found Miranda’s quote repeated in quite a number of denier’s blogs. Haha!! A working bullock “nursed back to health” – with bed pans, regular dressing changes and TLC? With the application of wet clay. He felt better in three hours. I have that kind of response to “insufferably warm” weather, too. Same here. Except it’s usually thrown at me from a distance rather than applied for soothing purposes. Sorry the “nursed bullock” thing was too much to resist. a Turn-Bull-locked into an ideology not of his own choosing? The real interest here is how Devine came across this ‘information’…I’d suspect it was fed to her by some wingnut, possibly the nutcases who regularly feed Murdoch’s professional trolls their junk science…who else is going to trawl TROVE for misleading weather anecdotes? Most arrogant journalists arguing against the science of climate change think that “debating” the issue is the correct way to decide what is true and what is not. A person in debate mode will pluck snippets of information to build their case. But herein lies the flaw of their approach. They argue against science which uses peer review, testing and modelling, core samples, measuring etc. Science gathers information and repeatedly tests it to be true. It is in essence searching for truth about the real world. So when a journalist, who works for a paper known to have vested interests expresses an opinion as a truth they need to either “refute” the current science in the acknowledged ways (testing, maths etc). Using dubious sources and selective here say don’t cut it. All they end up doing is showing how flimsy their beliefs are, and that proclamations of truth should be treated as total non-sense unless proved otherwise. In a time of ‘alternate facts’ the source of news becomes ever more important. The newscorp papers have about a 9% public trust rating (based on a recent study for ABC). That is a reputation well earned. Unfortunately it will only make the top ten this week. plenty of times as a surveyor in the old days correcting the steel measuring tape expansion for the 55 degree temp in the sun .. on a 35-40 degree day. duuuhhhh. Strident sneering opinions and dumb dont mix too well. I do remember having to use a tape and make sure you held it a certain pressure to endure you got a pretty correct measurement. Now we use GPS to locate the datum then we establish the distance and relative altitude from that point. Meanwhile the county has move 1.5 meters north from the first measure of this point. Yes I know that is being pedantic however relative to any other point on the area it will stay the same. But in a macro situation the whole of the continent has move north over the last 40 or 50 years. I’m kind of intrigued most comments here are just ‘how dumb’, and dismiss it, instead of looking at it a bit further. Of course it’s journalistic schmooze to quote the “129degF in the sun” for impact, but behind it is whatever the actual “Stevenson Enclosure” temperature was – which we will never know for 1837. I would say she is trying to make the point that extreme temperature clusters of days are not unknown in the past, and that it is simplistic to just accept modern “record temperatures” statements at face value, without reference to previous extremes. For example, Jennifer Marohasy and Ken of Ken’s Kingdom, both take statistical pains to show that BoM (and NASA-Goddard et al) can be shown to play fast and loose with historic measurements. It is not as clear-cut as IPCC would have you believe. Science is the loser from either extreme. Jennifer from the Institute of Public Affairs ? Notice when compared to this https://tinyurl.com/h4d9tvg where the last few points of the graph are not cut off there is a big difference. I’ve always cautioned fellow skeptics that it’s dangerous to claim no warming. There has been warming. The question is how much warming there’s been and how does that compare to what’s expected and what’s predicted. 100 deg F in Winter, that’s just nuts. What are we actually talking about here? Data or character assassination? You seem to be arguing on the (polarised) lines of is/isn’t, whatever you define ‘warming’ or lack thereof to be. This is not science. JM’s claims regarding ‘homogenisation’ being demonstrably invalid for sites like Amberley are either true or false – which is it, based on a data (non-ideological) approach? Similarly Ken’s claims have qualifications around them – ‘The Pause’ is largely finishing based on his pre-set criteria – I just do not read his comments as being polarised/partisan as the latter example you gave me. My point is that any argument should be about validity of analysis of data, and which data; – not about one-eyed barracking for your favourite ‘team’ – you’ll get better satisfaction at a footy match. – The assertion that the temperature in the past was the same as it is now. You seem to be arguing on the (polarized) lines of is/isn’t, whatever you define ‘warming’ or lack thereof to be. – Agreed let’s see what we can do. I can reference science but am not a scientist so don’t presume to do science. JM’s claims regarding ‘homogenization’ being demonstrably invalid for sites like Amberley are either true or false – which is it, based on a data (non-ideological) approach? Similarly Ken’s claims have qualifications around them – ‘The Pause’ is largely finishing based on his pre-set criteria – I just do not read his comments as being polarized/partisan as the latter example you gave me. – Yes the pause that occurred in land temperatures excluding the poles has finished. – I am not at all familiar with his work my comment was based on a very brief look at his latest post where it seems to be missing the most current data. – If he is stating that the so called pause is finished I didn’t see too much point in digging further as this is self evident. We now have to choose who to believe or repeat all of the calculations for ourselves. Ok, you summarise by appearing to say you have no choice, but to “take sides”, and I get the impression further that you don’t care to consider anomalies. Well, my points are about anomalies and seeming poor responses from BoM or whoever, when these things are pointed out. If an anomaly is explicable, then it should be straightforward for a lay person to comprehend it’s veracity. Otherwise we would all blindly believe what advertiser’s tell us. So the Climate Progress article you referred to reads more like advertising copy. (It doesn’t read like advertising copy BTW) It is a matter of evidential logic to see that BoM is cooking the figures in this case. But it doesn’t mean that I’m saying BoM is “all wrong” – far from it. It is what it is – bad practice that needs to be called out and rectified. The BoM can then make whatever conclusions it wants once that is done – it must act true to it’s data, once the data is true. There is an approximately 20 degree centigrade difference, so the 46.9°C in Penrith, in an equivalent measure to Miranda’s would be ~66.9°C…10°C hotter than Miranda tried to make the 1832 temp. Miranda writes clickbait and is little better than the Daily Mail. I agreed that the example MD quoted was poorly chosen. It’s not the point I was making. The editor of The Cairns Post wrote a similar piece a couple of months ago. No BS figures, but the same gist, encouraging people to be fatalistic. Another, Julian Tomlinson wrote an article praising Bernardi. In it he said the NOAA ‘climate scientist’ (he’s a data analyst) has uncovered a new Climate gate. Newscorp are a stain in the this nation. As an aside, a journal by Watkin Tench describes a summer day at Richmond in 1790 where flocks of birds were dropping out of the sky. The funny thing is its going as standard on car stickers.